Is it Expensive to be Vegan? The first time I ever tried gnocchi was 2 years ago. I was browsing Pinterest (’cause duh, what else would I be doing with my time?) and came across this mysterious dish called “gnocchi”. 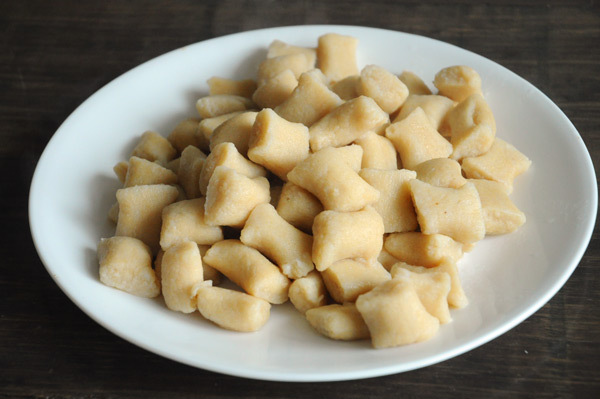 Pasta made out of potatoes and flours. Pu-lease. I am too sophisticated for that. But I checked out the recipe anyway. I’m inquisitive like that. It looked easy (ha!) and the photos were mouth-watering so I thought I’d give it a try for dinner the next night when my best friend was coming over. Best friends forgive you when you mess up new recipes. But wouldn’t you know it – my friend, who is Italian (!!! 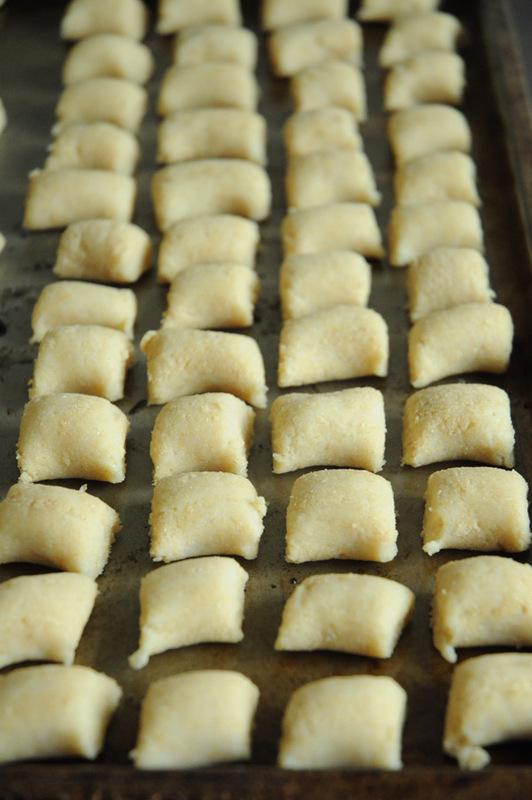 ), actually helped me make the gnocchi that night because her grandmother had taught her. We had her granny on speed-dial during the whole process, and every time we got stuck on something (this recipe was supposed to be EASY, you guys! ), we’d give her a ring, she’d sigh at our lack of gnocchi knowledge, and proceed to tell us what to do next. After 3 hours (OMG 3 HOURS MAKING “EASY” GNOCCHI), we were done. Starving, exhausted, but so proud of ourselves! It was one of the best meals I’ve ever eaten. And then I had to go and become vegan. And so I can’t make Italian granny’s recipe anymore because “the eggs are important”. I think she’d lose her mind if I asked her “would flax eggs work”. And I can’t have a little old Italian lady hating me, so let’s avoid asking her that, mmkay? But then recently I really, really wanted gnocchi. It came out of nowhere. You know when you’re in the store and you see the most beautiful dragonfruit ever and even though you’ve never had dragonfruit before, you just want to dig right in, right there in the middle of the grocery store. Imagine that feeling times infinity and that’s how I felt about gnocchi last week. For two days straight, it was all I could think about. Could I use flax eggs? (Shut up, brain!) Could I just eliminate the eggs altogether? What was I going to do? 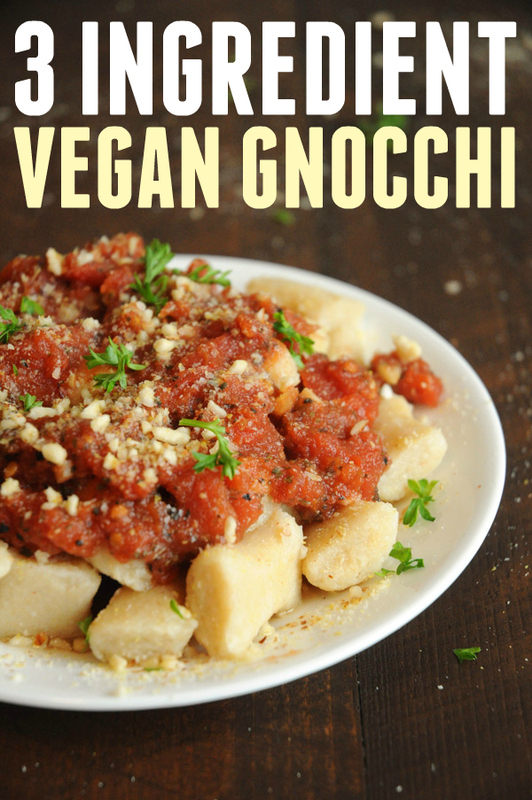 How could I make vegan gnocchi that actually tasted good (and didn’t take 3 hours to make – ’cause no, thanks – not gonna happen again)? Eventually, I got so desperate that I just started throwing ingredients into a bowl. Flour all over my shirt, in my hair, and mashed potatoes stuck to every surface in my kitchen. But did I care? Nuh-uh. I was making gnocchi! With a bit of trial and error, I managed to make the most delicious, perfect little gnocchi friends I’ve ever tasted. I even pat myself on the back, I was so proud. And then I ate my way through that pile of gnocchi in no time flat. OMGOSHHHHHH I MISS YOU, GNOCCHI! 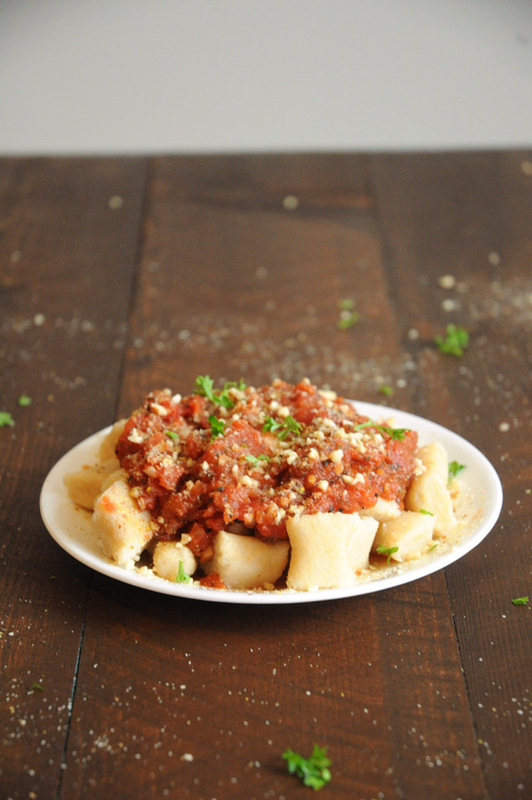 Not only is this gnocchi easy to make, it also uses just 3 ingredients. What?! Yes. 3. As in 1, 2, 3. 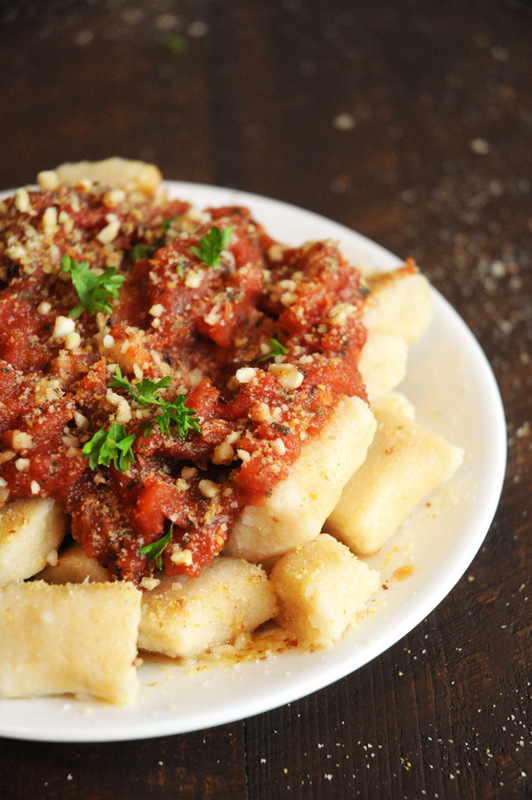 Why do Italian grandmother’s have to make gnocchi so complicated? 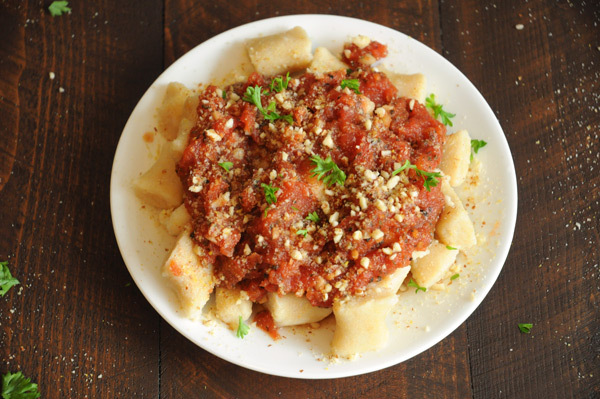 The quicker I can get gnocchi in my face the better, and this 2-ingredient recipe is my new go-to when I’m craving pasta pillows for dinner. Preheat oven to 375F. Poke your potatoes with a fork and place on a large baking sheet. Bake for about 1 hour, or until a knife can be inserted into the middle of the potato easily. Slice the potatoes down the middle lengthwise and allow to cool for about 5 minutes. With a clean kitchen towel, grab hold of one of the potatoes and scoop the flesh out. Repeat with remaining potatoes. Pass your potato flesh through a potato ricer and place it all on a clean surface in your kitchen (the counter, the table, etc.). Gently spread out the potatoes on your surface and start sprinkling the flour on top, about a cup at a time. Cut the flour into the potatoes with a large spatula. Once the flour is absorbed, add another cup of flour, repeat and add ½ cup of flour and cut it in, as well. If you need the final ½ cup flour, add it, and cut it in. If you don't need it, just leave it out. You should be able to form the dough into a large disk. Dust with flour and then wrap your disk in plastic wrap and allow to sit at room temperature for about 45 minutes. Cut a chunk of the dough off of the disk and roll it until it is about ½ inch thick. Cut the roll into 1-inch pieces. Repeat with the remaining dough. Heat a large pot of water over high heat. Once the water is boiling, add 1 tsp salt, then add a bunch of the gnocchi (do this in batches - don't over-crowd them or they won't cook properly). They should sink to the bottom and then float to the top when they are done (about 2-3 minutes). Serve with marinara, vegan parmesan cheese and fresh basil or parsley. My kids and I love Gnocchi. I recently became vegan and was wondering if I could make them without the egg. We will be making a batch this weekend. Super excited! Thank you! Hi. Recently became a vegan, but I’m a student. I only have Sunday nights to cook long pieces so wondering if this can be frozen before or after cooking? Use a Coffee grinder ? , just a thought , hey I was wondering if you had a marinara recipe to go with it or do you use a bottle bought from the store? can you use a food processor? Made this recipe last night with all purpose flour, it turned out perfect! I’ve never had gnocci with eggs before so I can’t imagine what the texture would be like, but these were perfect! I tried the recipe using Bob’s Redmill garbanzo bean flour. It smelled bad both before cooking and after. Epic fail. Will try the recipe again using JUST regular flour. This recipe looks perfect and I am planning on trying it tonight! However, what is a potato ricer, and are there any alternatives to using this? And yes, you can just mash them by hand (but the potatoes won’t get as smooth and airy, which is ideal for gnocchi).